Pocket Cutter: A pocket tool often used for cutting or drilling, which can also be used for self defense or more nefarious purposes at extreme close range. Skill: Beam Weapons (Pistol). Aperture 0.025 cm. Beam energy 0.06 kJ. Energy used per shot 0.08 kJ. Extra power cell 0.008 kg, $0.4. Holdout Blaster: An easily concealable blaster for personal defense. It lacks a proper grip and sights, limiting its ergonomics and accuracy. Skill: Beam Weapons (Pistol). Aperture 1 cm. Depth of focus multiplier 0.25. Beam energy 0.06 kJ. Energy used per shot 0.08 kJ. Extra power cell 0.008 kg, $0.4. Pocket Blaster Pistol: A compact blaster designed for concealed carry. Skill: Beam Weapons (Pistol). Aperture 2.5 cm. Depth of focus multiplier 0.18. Beam energy 0.3 kJ. Energy used per shot 0.4 kJ. Extra power cell 0.04 kg, $2. Blaster Pistol: A common blaster sidearm, popular with law enforcement and civilians who feel they need protection. Skill: Beam Weapons (Pistol). Aperture 2.5 cm. Depth of focus multiplier 0.2. Beam energy 0.5 kJ. Energy used per shot 0.6 kJ. Extra power cell 0.25 kg, $12. Heavy Blaster Pistol: A large, bulky sidearm with a powerful beam discharge. Skill: Beam Weapons (Pistol). Aperture 3 cm. Depth of focus multiplier 0.2. Beam energy 0.8 kJ. Energy used per shot 1 kJ. Extra power cell 0.4 kg, $20. Pistol Cutter: A cutting and drilling tool with a pistol grip. Skill: Beam Weapons (Pistol). Aperture 0.06 cm. Beam energy 0.8 kJ. Energy used per shot 1 kJ. Extra power cell 0.4 kg, $20. 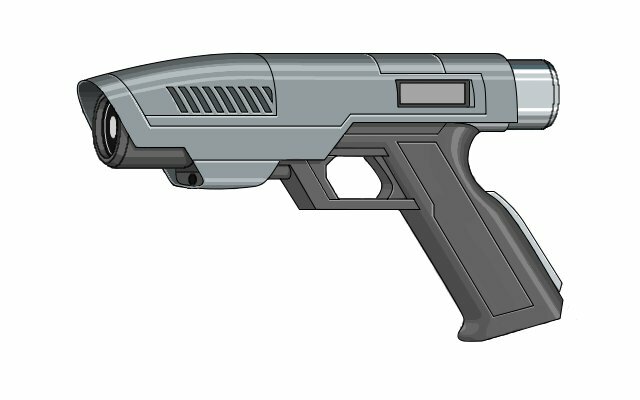 Auto Blaster Pistol: A large, fully automatic sidearm for paramilitary use. Skill: Beam Weapons (Pistol). Aperture 3 cm. Depth of focus multiplier 0.2. Beam energy 0.7 kJ. Energy used per shot 0.9 kJ. Extra power cell 0.5 kg, $25. Blaster Carbine: A light and maneuverable longarm for heavy hitting power in crowded conditions. Skill: Beam Weapons (Rifle). Aperture 5 cm. Depth of focus multiplier 0.12. Beam energy 0.9 kJ. Energy used per shot 1.2 kJ. Extra power cell 0.6 kg, $30. Assault Blaster: A common light infantry weapon. Skill: Beam Weapons (Rifle). Aperture 6 cm. Depth of focus multiplier 0.12. Beam energy 1.5 kJ. Energy used per shot 2 kJ. Extra power cell 0.9 kg, $40. Hunting Blaster: A blaster popular with hunters and sportsmen, capable of dropping large game. Skill: Beam Weapons (Rifle). Aperture 6 cm. Depth of focus multiplier 0.15. Beam energy 2.5 kJ. Energy used per shot 3 kJ. Extra power cell 0.18 kg, $9. Heavy Duty Cutter: A two-handed torch for tough cutting and drilling jobs. Skill: Beam Weapons (Rifle). Aperture 0.09 cm. Beam energy 2.5 kJ. Energy used per shot 3.5 kJ. Extra power cell 1.5 kg, $70. Battle Blaster: An infantry longarm with enough punch to drill through most personal battlefield armor at close range. Skill: Beam Weapons (Rifle). Aperture 6 cm. Depth of focus multiplier 0.15. Beam energy 2.5 kJ. Energy used per shot 3.5 kJ. Extra power cell 1.5 kg, $70. Sniper Blaster: A long range blaster for precise shooting from a distance. Skill: Beam Weapons (Rifle). Aperture 10 cm. Depth of focus multiplier 0.09. Beam energy 2.5 kJ. Energy used per shot 3.5 kJ. Extra power cell 1.5 kg, $70. Dinosaur Blaster: A blaster designed for very large, dangerous, thick skinned game, whether rhinos, elephants, or Tyrannosaurus. Skill: Beam Weapons (Rifle). Aperture 8 cm. Depth of focus multiplier 0.18. Beam energy 7 kJ. Energy used per shot 10 kJ. Extra power cell 0.2 kg, $10. Light Support Blaster: A squad support level weapon designed for sustained rapid fire. Skill: Gunner (Beams). Aperture 10 cm. Depth of focus multiplier 0.09. Beam energy 2.5 kJ. Energy used per shot 3.5 kJ. Extra power cell 7 kg, $350. Heavy Support Blaster: A rapid fire light anti-material blaster. Skill: Gunner (Beams). Aperture 12 cm. Depth of focus multiplier 0.15. Beam energy 20 kJ. Energy used per shot 25 kJ. Extra power cell 50 kg, $2500. Strike Blaster: An anti-vehicular blaster common on aircraft and light armored vehicles. Skill: Gunner (Beams). Aperture 20 cm. Depth of focus multiplier 0.12. Beam energy 40 kJ. Energy used per shot 60 kJ. Extra power cell 120 kg, $6000. Blaster Cannon: A blaster common on tanks and naval ships. Skill: Gunner (Beams). Aperture 30 cm. Depth of focus multiplier 0.25. Beam energy 1500 kJ. Energy used per shot 2000 kJ. Extra power cell 900 kg, $40000. Space Blaster Cannon: A blaster with a large aperture for long distance space combat. Skill: Gunner (Beams). Aperture 100 cm. Depth of focus multiplier 0.12. Beam energy 7000 kJ. Energy used per shot 10000 kJ. Extra power cell 4000 kg, $200000. Recharging pack: A battery pack that can recharge power cells between firefights. It does not provide enough power to directly shoot most blasters, but it can continuously provide 4 kW of power while the power cell is at less than maximum capacity, for a maximum energy of up to 20000 kJ. Divide the power supplied by the energy per shot of the laser to find the time to recharge one shot, divide the maximum energy by the energy per shot to find the total number of shots that can be supplied when fully charged. Mass: 1 kg. Cost: $100.